Microsoft Edge is the latest web browser from Microsoft, which aims to replace Internet Explorer in the latest versions of Windows for desktop PC, Surface, and Windows Phone. While most Mac users may not need to access or use the Microsoft Edge web browser, others in Mac OS X may require using Edge to access specific websites, and it’s particularly common for web developers and web designers to need to use a wide variety of web browsers for testing purposes. Thus, we’re going to show Mac users how they can easily run Microsoft Edge directly in Mac OS X, and entirely for free. 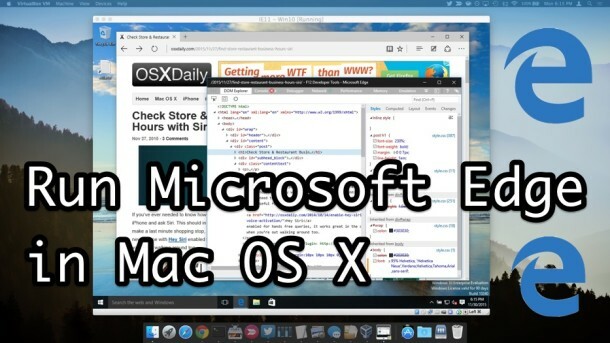 This walkthrough will focus on using a virtual machine to run and test Microsoft Edge in OS X, which at the moment is the only way to run Edge on a Mac without using Boot Camp or a complete Windows 10 installation. 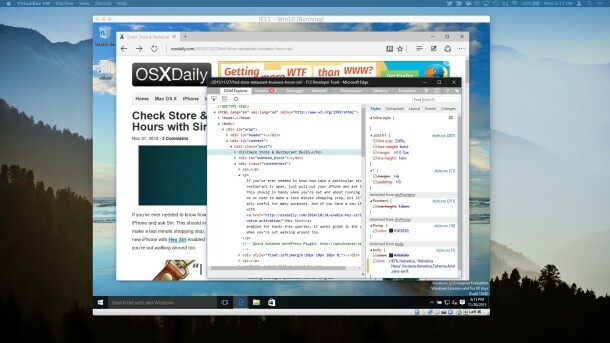 Eventually Microsoft Edge will be available through Azure similar to how OS X users can run Internet Explorer 11 on the Mac through Microsoft Remote Desktop, but for now the VM approach is how we’ll be running the Edge browser on a Mac. If you’ve had an IE VM before, you’ll find this is very similar, but with differing Windows and browser versions. 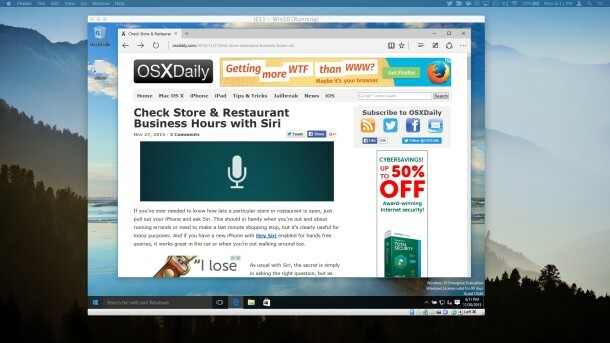 The Mac is now running a complete version of Microsoft Edge atop a Windows virtual machine, it’s fully featured so open up the Edge browser if you haven’t done so already and access the web as usual. 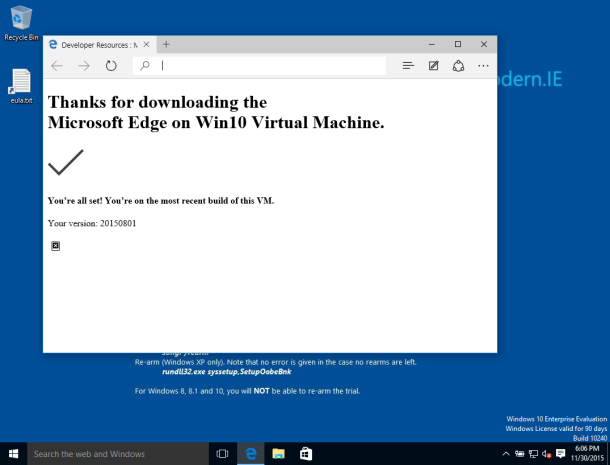 The complete Microsoft Edge Developer Tools set is available as expected, which is perhaps why many Mac users will be accessing this VM to begin with. 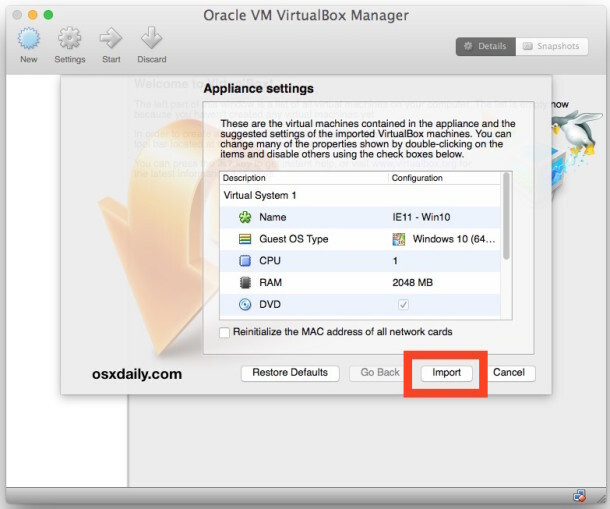 You can quit and shut down the virtual machine at any time which requires a normal boot, or create a saved state if you wish to return to the exact place you left off in the VM. Running a Windows VM like this has some benefits over using the Remote Desktop approach to running Internet Explorer, including offline access, but perhaps the most obvious downside is that you’ll be using more system resources and the virtual machine takes up about 11GB of disk space. But, given this is primarily aimed at developers and designers, or those who need MS Edge to access a particular web site, that shouldn’t be much of an issue, particularly when compared to the ease of running virtual machines versus dual booting with a complete Windows 10 installation aside OS X in Boot Camp. * You are welcome to attempt to decompress the Microsoft Edge virtual machine zip file with any other extraction app, but don’t be surprised if the zip file turns into a cpgz, thus we recommend using The Unarchiver which avoids that issue. Additionally, The Unarchiver has vast compatibility for extracting archives of all sorts and makes a great addition to any Mac users app toolkit. This sounds great but in the screenshots I notice it says “Windows Enterprise Evaluation. Windows License valid for 90 days”. What happen after 90 days? Can you no longer test Windows Edge? If you used save states you can avoid the 90 day activation issue, otherwise it just clears everything out at 90 days resetting itself. Thus you don’t want to save anything to the VM, save it the the local file system instead. It’s really only for testing Edge/IE, you can always download a new IE VM too if a new version comes out. BTW Edge is the successor to IE. Why on God’s green earth would ANYONE actually WANT to do this? I don’t even like this crap browser on my Windows 10 system. Stay far far away people. Chad, maybe you should read the article? The explanation is in the second sentence, Chad, the second sentence. I can tell you didn’t too well in reading comprehension. I felt sorry for my ex-husband who just got a windows computer, due to all my Apple products moving out with me. I had to do all the configurations and installations , getting the best apps I could and security.. I couldnt believe how it, browbeats you by limiting the whole lalaptop’s functions then blamed you for the decrease in functionality citing “advertising as the financial engine of the internet”. I was truly disgusted by it and was happy to get back to my MBP, iMac etc. where the world of chintzy apps and greedy pushy downloads and pop-ups dont exist. well Chad, Microsoft Edge is the only one I know that runs Netflix in 4K. Seems like a hard way of doing it when you can have Microsoft’s cloud handle the heavy lifting. Yes, nice option but can be very slow and doesn’t like you leaving it idle for too long. Who cares…. I left MS a while ago and don’t care to use their products. At work, I have to support IE and I deal with all its trash on a daily basis. No way do I want anything from MS. Sounds like this person isn’t computer savvy in general. Computer savvy people shouldn’t have a problem with windows computers if they know what they are doing. Your parents are web developers? That’s cool. What do they think of Edge? Great tip, perfect for using Windows only tools. I wish Apple would buy out Microsoft, then liquidate the company. But then how would they get away with selling the same thing to everyone twice? No…Apple should not buy Microsoft, they would just add a new spinning hourglass to the OS. True point, but they would most likely bring windows app support to the mac in a way that makes viruses impossible to be compatible on Mac. But this would get Apple/Microsoft Sued for owning a Monopoly. Apple couldn’t afford Microsoft. What a laugh. You apple only fanboys have a crazy idea of what is possible. Microsoft could buy Apple, but not the other way around. Googling it, Microsoft’s market cap is $433 billion. Apple’s is $642 billion. On top of that, Apple has $203 billion in cash. So I’d say if they really wanted to own Microsoft, they could. Not that they’d want to. Microsoft is at best a third-rate company, so Apple wouldn’t have anything to do with them. Microsoft is doing a fine job at ruining themselves anyway. One constant in this universe: Apple fans just hate Microsoft. Matter of fact that is a stereo type. I run both Microsoft and Apple products in my household. Microsoft has its pros and cons as much as Apple. But they both are equal in a way. At this point its like comparing apples and windows they are both completely different ones a fruit, one is glass. p.s. trolling all Mac users is not the way to go! if you want to troll anyone troll yourselves. Better yet, how about we SHUN any Microsoft-provided browser this time instead of having to work to support it? Internet F’ing Explorer has been a thorn in our sides for decades and I for one am fed up with it. My own projects specifically do not support IE, and I tell them so if an IE user visits the site. If it works, great. If not, don’t b*tch at me about it. I recommend they look at more secure and better alternatives like Chrome. As an engineer, if you need to build product for a company that uses IE on their workstations, then you need to build a product for a company that uses IE on their workstations. “Company A”: Here’s $4,000,000, build our tools. B: Oh no, but we blew $1,000,000 in development. Company B goes out of business. Or you have a SAAS platform, and you want to secure that $4,000,000 contract. So you SAAS platform need support IE if the client needs it. Better to have it and not need it, than to not have it and miss out on a contract. 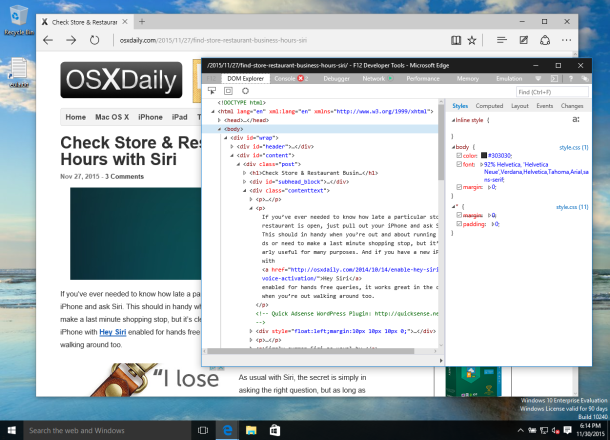 My question is.. How did you get the osxdaily.com inside the screenshot?? 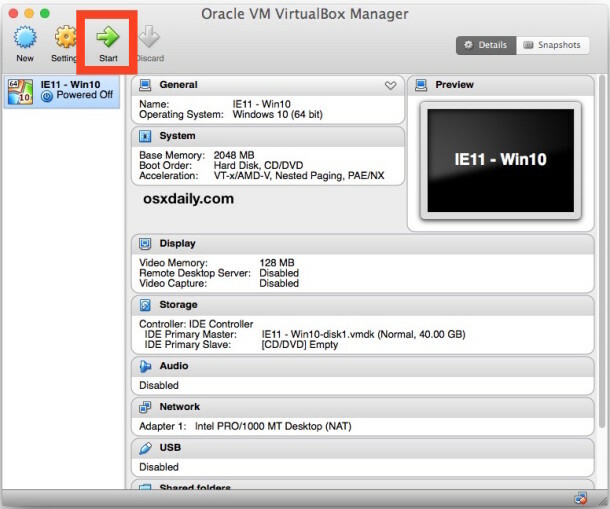 This is pretty cool, but it still requires to have a vm, what about trying to run in via WINE? Well… if something were not to work, would you want to drive yourself crazy debugging something that may be a problem in wine? Interesting comments. I find it interesting that people are so one sided… I too use both platforms – and have since the early 80’s. Primarily Mac now due to starting a photography company. For years I was in the software business world – and mostly windows shops were the order of the day. Don’t forget – these are just tools. I always thought that MS gave everyone job security. Shoddy software is always having issues that need fixing and supplying everyone with lots to do! Nothing at all wrong with that. Every software package has it’s faults – Everyone’s needs are different. They’re just tools people….just tools. Agreed. I love all operating systems. I love the massive library of apps and tools available on windows, which increases productivity. If I want to work on a design project, Mac OSX has done the job better for me and has a cleaner interface in my opinion, and linux (especially Ubuntu) is the best when it comes to full customization and control of your internals. Thanks so much for posting this. It’s been very helpful. It’s much cheaper than the other solutions I’ve come across. Awesome tutorial. Really well explained. Thanks! Instructions worked well. But running in the VM is it asking for a sign-in password to use Edge. I tried all pertinent combinations but none worked. Is there something I am missing in setting this up? Just stuck with it too. So I found it it is – Passw0rd! My VM is starting with “Automatic Windows Repair” screen. Have I missed any settings ? Edge is a funny animal. It’s never been really been fully tested in our environment and quite frankly, confuses people who think it’s IE. They see it on the task bar, click on it then wonder why it doesnt automatically go to our intranet. Then they call us WASTING our time. I say ‘let me take control’ and delete the start icon from the task bar immediately & show them how to find IE & Chrome. I can understand developers needing it for testing etc but I’m not putting a VM on my mac so I can run some crap MS software. I don’t develop for the internet so I’m not letting that bloatware on my MAC. I am unable to reproduce the steps above as directed, things seems to have changed a little bit.